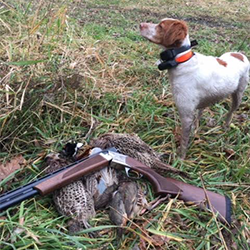 "Our female Brittany from Sovereign Brittanys is the perfect loving companion and bird dog. Eager to please, with a sweet temperament; Millie exceeds all our expectations in a hunting dog. Simply an exceptional hunter and family dog." - Lisa and Chris in Mendota Heights, MN "I cannot say enough good things about Sovereign Brittanys and Dawn Droel. 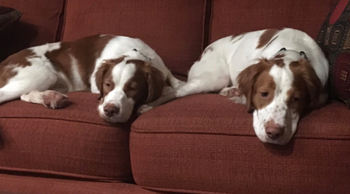 When I was looking for a hunting dog, I had decided on a Brittany for their ability to hunt and be an excellent family dog. I researched numerous breeders in the Midwest and found Sovereign Brittanys and could not be happier. They are committed to breeding top-notch dual purpose dogs. We travelled from Missouri to pick up our first dog Jaxon. He showed amazing prey drive and pointing instincts immediately. Brittany trainer Bob Burchett worked with him as a pup and he is now nearly 3 and is an energetic and excellent hunting dog along with his easy transition to a family dog. We were so happy with our experience, we ended up getting a second dog, Dakota, and had the same great experience. He too has worked with Bob and has an excellent nose for birds along with great prey drive. I would HIGHLY recommend Dawn and Sovereign Brittanys if you are looking for a great hunting and family dog combined." "We have gotten two great dogs from Dawn! They both have awesome temperaments and have always been very healthy! They adjusted very well in our home and quickly became part of the family...more like kids than dogs. Dawn is always available for questions and support whenever you need it! We even thought about adding a third pup to the group from Sovereign!" - Dr Mike & Joni in Columbia, MO "We have had 3 different Sovereign Brittanies over the past 20+ years, both a male and females, and simply cannot imagine our lives without these superb family members. We are not a hunting family but all 3 are finished show champions and are tremendously versatile and personable in every other way a dog can be, whether it is hiking, going to the cabin, cross country skiing, horseback riding, or family events with all ages. The Droel’s breed Brits that are smart, exceptionally sound, and easy to train because they have such a will to please and be your constant companion. We cannot thank Sovereign enough for the fine kennel they have established to bring us these lovely dogs." - Dave and Anne in North Oaks, MN "In the year 2000 I wanted to get a family dog that would be friendly, loyal, athletic, and hardy enough to live in Minnesota. However, I did not want one of the common breed of dogs found in every home. 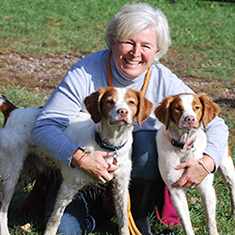 My background and interests told me I wanted a sporting dog, so through research of the different sporting breeds, I decided that an American Brittany would be perfect for my family. The Brittany AKC standard states that a Brittany is "a compact, closely knit dog of medium size...30 to 40 pounds. Strong, vigorous, energetic and quick of movement. Ruggedness, without clumsiness, is a characteristic of the breed. 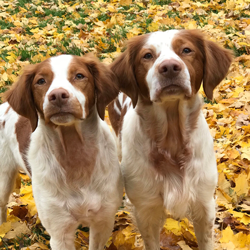 "Sovereign Brittany's is dedicated to breeding American Brittany's to meet this AKC standard and preserve the characteristics that make the Brittany a premiere field, show, and family dog. 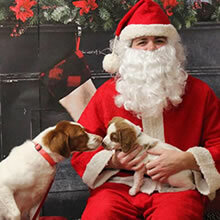 Sovereign Brittany's commitment to producing quality puppies is evident in their dogs. They have devoted their lives to their line of Brittany's and it shows in everything they do. 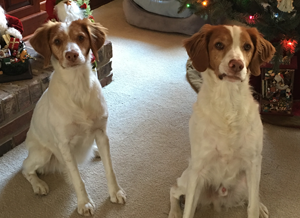 I own two Sovereign Brittany's now since that first family dog 18 years ago and I wouldn't change a thing." 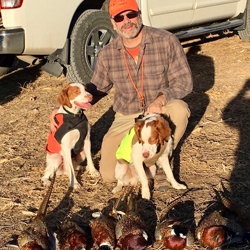 - Doug & Christine in Champlin, MN "We decided to bring Brittanys into our lives two years ago after much research: they are great family dogs, good hunters, energetic companions. Fortunately, we found Sovereign Brittanys and couldn't be happier with our experience. We now have two and they are perfect for us: Dawn and Joe work hard to make sure that the puppy's personality fits the family they are joining. Our dogs are sweet, in fantastic health, fun to hunt with, and great companions. They fit our family perfectly. The Droels have been excellent teachers and available to answer all of our questions about raising well-mannered pets. We can't recommend them highly enough!" - Drs. Rachel & Brandon in St Paul, MN Owning a healthy, well-adjusted, well-trained Brittany requires commitment and a thoughtful investment in both time and money. Not just from you, but also from your breeder. Having a trusted, experienced and compassionate breeder as your partner gives both you andO your dog a great head start. My three Sovereign Brittanys (Breaker, Levi and Indy) have given me some of the greatest joy and enrichment of my life. And that is as much because of Dawn and Joe as it is because of their wonderful dogs. With their support and encouragement I went from never having owned a dog to getting my first dog at 48 and my first puppy at 50. I now compete (for fun mostly) with my dogs in hunt tests, agility and rally. I have made new friends and learned new skills through obedience and agility classes as well as Minnesota Brittany Club activities and dog shows (although I don’t show my dogs). Dawn and Joe are very active at the local, regional and national level in both show and field with their dogs and will help you achieve as much as you want out of your dog. I couldn’t have asked for better partners on my dog journey." - Karen & Steve in Minneapolis, MN "Over the last 20+ years, we have enjoyed 3 Brittanys from Dawn and Sovereign Brittanys. All have been healthy, happy, smart, confident, obedient, well socialized, loving and calm tempered. We are convinced there is no finer breeder of Britts than Sovereign Brittanys. We believe Dawn Droel is the foremost authority on Brittanys anywhere. We have had only Brittanys for the past 35 years. We would never consider getting a Brittany from anyone other than Dawn." - John and Cindy in Newnan, GAMore from John & Cindy.......... "Where to begin… We met Dawn about 20 years ago when we were searching for a Brittany puppy to replace Brandy, an exuberant Brittany who shared her life with us for nearly 17 years. Cindy and I do not have kids so picking the right dog was much like adopting a child. We did an exhaustive search and visited all of the local Brittany breeders we could find - keeping in mind the internet wasn’t the advanced search tool in the mid 90’s that it is now. We even began corresponding with the former National Brittany Club President. This nice lady said she was impressed with our efforts but there was one breeder we had not contacted in our area who had most calm temperament Brittany’s she had ever seen. Of course, that breeder was Dawn Droel. Our first opportunity to meet Dawn, very fortunately, turned out to be at a dog show near our home in Minnesota. We got to go “Back Stage” where Dawn had Moose. on the grooming table. We sat in a couple chairs alongside the table. Before the conversation hardly began, Moose gently stepped off the table into Cindy’s lap and gave her a gentle kiss on the cheek. The search was over. We just had to have one of Dawn’s pups. Naturally,Dawn was as curious about us as we were about her and her dogs. Thankfully we had the right stuff and passed muster. Some months later it was time to visit the litter at about 4 weeks. Many if not all the prospective new owners showed up although there was no picking of choosing allowed. During the hyper activity and epic cuteness, one of the pups wandered over and fell asleep in my lap. At 8 weeks it was time to go pick out our new family member. We choose wisely. We came home with Cooper. Cindy is sure it was the same pup that that chose us at the puppy preview. Cooper was a loved and loving family member for many years. His most unique feature was his insistence on singing along with the theme song to The Young and the Restless. It was the darndest thing. Near the end of Cooper’s life, we began corresponding with Dawn for advice and received not only good advice but much comfort. Of course, Cooper was irreplaceable, but that didn’t mean we could never love another dog just as much. And so, it is. We now have Louis, the smartest dog I have ever seen. Louis will open as many lever type doors as necessary to allow himself to go outside. When Louis was about 3, we thought it would be nice for him to have a sister. So once again from Sovereign Brittanys we purchased Daisy Mae, a year and a half old show champion. Louis and Daisy are inseparable. If we’re away from home for a while it’s comforting to know they have each other. Photos on this site may be copyrighted. Please do not download, use or reproduce them without permission.